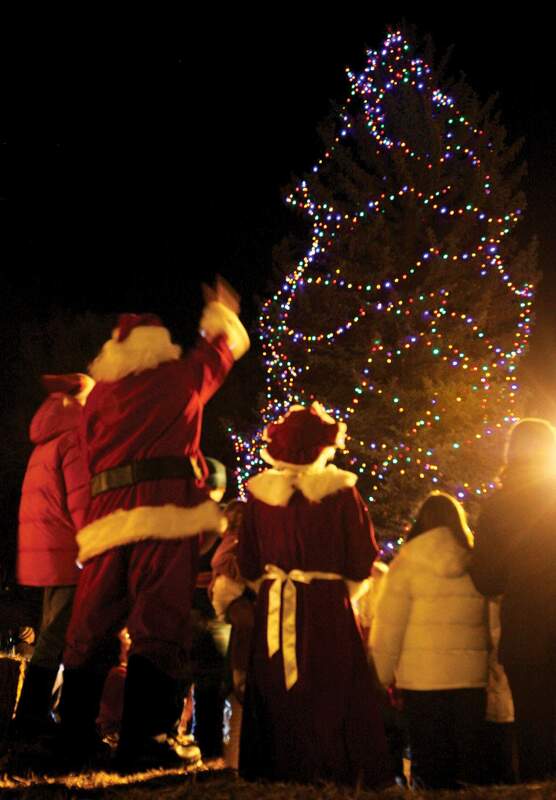 Mr. and Mrs. Claus, along with many elves, initiate the lighting of Durango’s downtown Christmas tree at Buckley Park in 2010. ‘Twas the week before Christmas and all through our towns / The events of the past year brought smiles and frowns. / So readers, indulge this most heinous of verses, / You cannot be faulted for catcalls and curses. The newspaper’s filled with some serious stuff. / In contrast, this column is nothing but fluff. / Curmudgeonly greetings – it’s time that we show ‘em / The annual doggerel, the Action Line poem. The biggest event of Two Thousand Sixteen / Was something the pundits could not have foreseen. / It’s not about Trump or deplorable minions / Or Hillary’s arrogant White House ambitions. It’s not that McLachlan unseated J. Paul / The year’s biggest story was not that at all. / The talk of the town was a sculpture gone dark / As crews disassemble that much-abused Arc. The city surrendered, the damage was done. / Capitulate means that the vandals have won. / The artwork inspired engagement and mirth, / So maybe its price tag was not its true worth. The roads in the county have gone to perdition. / Majority voters made known their position. “We can’t afford taxes,” they said with malignment, / Yet gladly will pay for their pickup’s alignment. The county’s reliance on oil and gas, / A bad combination that’s now come to pass. / If you want gov’ment services, here’s what the fact is / We simply must triple our property taxes. A huge bloc said no to the airport expansion, / An ill-defined plan for an airplane McMansion. / The first phase’s cost would be $85 million, / A sum that’s absurd to your average civilian. The place where wise people said money should go / To schools a’bleeding by revenue woe. / An ignorant dullard thinks teachers are moochers. / But we know that learning will lead to bright futures! The times are a changing, but one thing’s for sure / More fundraising “galas” we’ll have to endure. / Let’s hope the nonprofits will stop being rubes. / Enough of the box wine and plates of cheese cubes! The city’s kerfuffles in matters so urgent, / Distracted by zealots and viewpoints divergent. / The council obsessed with some parks gone organic. / They’re weedy, declining and thus time to panic. It’s “wellness” and “healing” the pot shops extoll, / The fact of the matter: they’re out of control. / But so are the beggars and coal-rolling teens, / And uppity cyclists and trash-fed ursines. As anyone sees when they’re real estate browsing: / There is no such thing as affordable housing. / Because in Durango you’re gonna pay double / To live in this charming but vacuous bubble. There’s round after round of utility hikes. / But, hey, let’s accommodate ‘lectrical bikes! / Why can’t we keep our priorities straight? / A firm answer “no” will mean less on our plate. Durango’s amusing and pretty darn quirky / So Action Line’s job is to gripe and talk turkey. / But don’t take this poem as pessimist chidings. / Be of good cheer and glad holiday tidings. May your days be merry and shiny and bright, / The woes you encounter be petty and slight. / To you, we extend the most warmest of wishes, / From yours truly here and from Action Line Mrs.
E-mail questions to actionline@durangoherald.com or mail them to Action Line, The Durango Herald, 1275 Main Ave., Durango, CO 80301. You can request anonymity if a spoon is the only thing stirring on Christmas Eve.